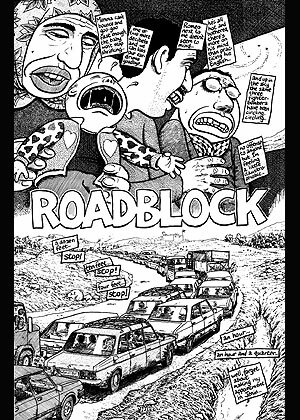 Joe Sacco takes us through the Occupied Palestinian Territories during the first intifada against Israel in his comic documentary penned during that same time. From the Green Line and back, he relays events from the other side of the (security) fence, sharing tea and tragedies with the people living there, trying to lead his reader toward a more germane understanding the Palestinian odyssey. Sacco remains a diligent observer and a fact-checking savant* ensuring the absence of morose sentimentality in his reportage while at the same time escaping the tedium of traditional news coverage. To wit, the terms “militant” and “terrorist” are used more judiciously, if at all, and his coverage thus is less laden with the weight of such terminology. He conveys a malevolent and complicated situation in palatable form (i.e. drawings), doing so without being beholden to advertisers or ideologues, and travels through a land where many have yet to explore. Still, Sacco is no fence-sitter himself. We are shown Palestinian injustices on a Goliath-like scale: convictions without trials, systemic land grabs, arbitrary torture, refugee ghettos, house demolitions, and Israeli settlers cruising the streets with Uzis like it’s the Wild West. Frame after frame, Sacco barrages us with images that underline the paranoia and the chaos of a people under the shadow of a long and controversial military occupation. Words and images intermingle on the page, mostly in all capital letters amid a proliferation of bared teeth and close-up grimaces. Yet Sacco too, sees small tokens of humor amid the bleakness. With great wit, he pokes fun at the monotony of Palestinians’ repetitive and dreary stories, the apathy of the Israel Defense Forces, the ubiquitous rock-throwing kids, and his own journalistic glee at witnessing some “bang bang.” Though at its core, the humor is dark indeed. As one Palestinian after another gets beaten or imprisoned in Sacco’s book, you begin to wonder, is this an exaggeration, rendered even more so by its comic form? Having spent two months in the West Bank myself, Sacco’s Palestine is, I firmly concede, the next best thing to being there. In this comic book, there is no foreseeable happy ending for anyone, if even an ending at all. Fast-forward to today, post-intifada, and nothing much has changed, and in some parts of Israel, life is worse. In other words, in an ever-increasing borderless world, there are still places where walls are erected. To wit: the barrier between Israel and Palestine is expanding, and Israel persists in building settlements in expressly Palestinian sections of the country despite UN resolutions against such a thing. And while Israel enjoys foreign trade with Mexico, Canada, the USA, and the EU, Palestinians enjoy trade with basically just Israel**. Whether you agree with Israeli policy or not, Sacco shows us unencumbered facts on the ground, and through his rigorous research and observation that though violence has ebbed, the struggle over the land and the people who live there continues unabated, and his book, unfortunately, remains timeless. * At a reading in Berkeley, CA, Sacco stated he typically confirmed a story through diligent research and obtaining back up sources where available. Great review and timely, good to know it is being read and shared in places where a different side of the story often gets more press.